Over the past 4 years that I have done rock crawling competitions, I I can't count how many penalty points my team has received due to improper communication. The majority of the time it has been because the driver could not hear my directions, and did something else. Those errors varied from hitting a cone, to rolling over. When the crowd is yelling, the judges are yelling, the rig is roaring, and the adrenaline is flowing, it can be next to impossible to communicate. We have tried using various radios in the past, and have had limited success. We have tried simple Radio Shack models all the way up to the top of the line desert racing units. All of these radios are what's known as "half duplex". This means that only one person can talk at once. Half duplex communication systems work well in many different scenarios, such as desert racing. They require you to push a button to talk. FRS radios (Family Radio Service) are one of the most common type of half duplex radios used today. There are half duplex communication systems that don't require you to push a button to talk. They have a feature called "voice activation" which automatically keys up the radio when you talk into the microphone. The Radio Shack systems we used in the past had this so called "feature" and it works marginally well, at best. The problem is it takes sound to activate the "voice activation" so when trying to communicate with the driver, the first word or two would be cut out. In our sport there are many one word commands (such as STOP!!!!!!) so this type of radio is not adequate for our needs. What about using cell phones? Cell phones are considered "full duplex" because both parties can speak at the same time. Couldn't you just wear a headset and use two cell phones? Sure, if all of our events were in major metropolitan areas where there is good, reliable digital cell service. But most of our events are in the desert, and back country. 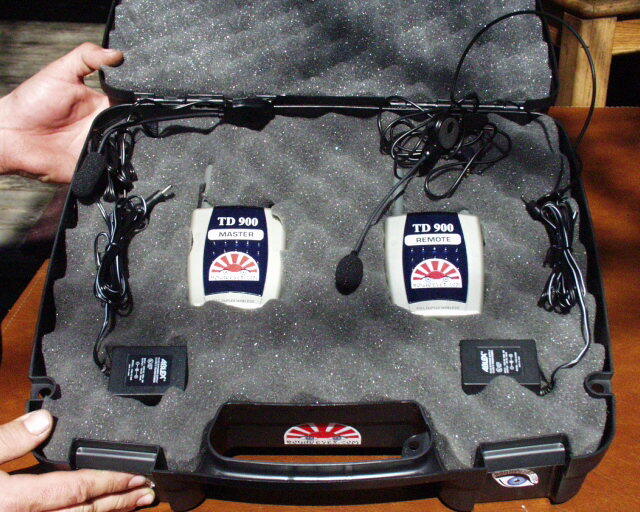 Roundeyes.com Rock Talk communication system. Roundeyes.com has come to the rescue with two of the ultimate radio communication systems available. They offer two full duplex radio systems that allow both spotter and driver to talk at the same time. There are no buttons to push, and you don't have to worry about cell service. Simply turn on the radios, and talk like you're on the telephone! When I found out about the Roundeyes.com radios, I went over to their office in Placerville, CA to check them out. Roundeyes offers two systems - the analog "Rock Talk" system, and the digital "Digi Talk" system. The analog system is more budget friendly, and costs about $375 for two radios, two chargers, two headsets, and a sweet padded carrying case. The digi talk radios are for the serious team who want the best of the best. The Digi Talks sell for $1200 and come with the same accessories as the Rock Talk radios. 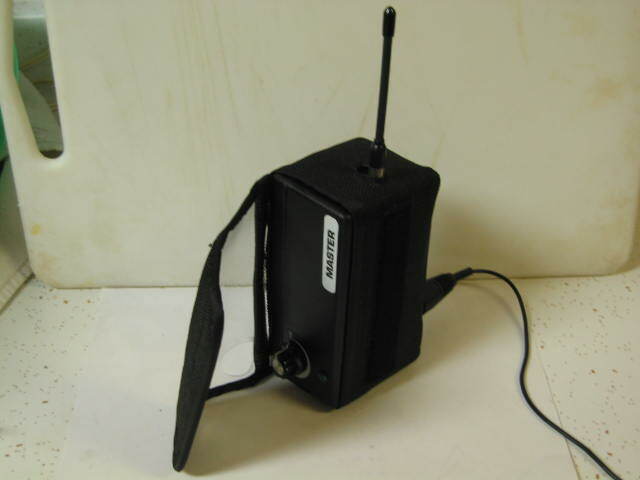 Roundeyes radios have noise canceling microphones that fit around the back of the head. So what's the difference between the two? The analog systems work on shared radio frequencies. The radios come with dip switches to change the channel to find your own private channel, but like FRS or CB Radios, there are only a limited amount of channels. It is possible to be on the same channel as another team, at an event, and receive interference. A nice feature the Rock Talks have is a quick channel change button on the top of the radios, so if you do receive interference from another team or source, you can simply push the button to change over to one other frequency right away without having to fiddle with the dip switches. The Rock Talk radios have about a 300 foot range. The Digi Talk radios are the creme de la creme of communication radios. These bad boys are a little bulkier and heavier than their cheaper Rock Talk brothers. The Digi Talks are pure digital, and run on their own "private" channels. There is no worrying about interference from other radios, or other sources. The Digi Talks also have a longer range than the Rock Talks - about 1/4 mile. The Digi Talks are also capable of having up to four radios programmed on the same frequency with full duplex communication. Since Mike's budget was about $500, I wanted to test out the Rock Talk radios. At $450, the Rock Talks fit our budget. Bruce and I put on a set of the Rock Talks and went for a hike down along the American River. I couldn't believe how well they worked, and how clear they were. The units are very lightweight, and have a built in belt hook on them. The radios use a cordless phone battery, so the battery life is great (about 5 hours of talk time). I haven't tried it, but I'd be willing to bet a single charge would last two entire days of competition on a single full charge. So how do they work in competition? The entire Team Shaffer team used the Roundeyes.com Rock Talk radios in the 2004 season, and they worked flawlessly. We had an issue with one headset getting destroyed on accident, and Roundeyes had us another headset the same day. Their customer service is second to none. Roundeyes prides themselves on getting their product to you on time, every time, and our need for a new headset that same day was no exception. Over the course of the year we experienced minor radio interference (cross talk) from other competitors, but it never became and issue. We were able to simply use the quick channel change button on the top of the radios to get our own private channel again. Digi Talk in it's protective canvas case. So which radio do I recommend, now that I have used both? I would say that for most, the Rock Talk is a great way to go. It's relatively inexpensive, and works great. If you gotta have the best though, then there's only one answer - Digi Talk. Check out Roundeyes.com and decide what radio is best for you. Roundeyes.com also offers many other unique outdoor products for the off roading lifestyle. Everything is available online with secure ordering.